Clients will be able to connect to providers in the healthcare and hospitality industries via Web browser or mobile phone. A Web and mobile application, ServiceIQ, is now available to connect service providers in the health, accommodation, hospitality and travel services sector to their customers. ServiceIQ is a software application that allows engagement between service providers and end-users. The application enables customers to create service requests electronically and publish them to registered service providers. Khashane Motloutsi, co-founder and service manager at ServiceIQ, says traditional means of connecting service providers and customers are no longer effective. Service providers don't have the right technology tools, says Motloutsi. "ServiceIQ aims to make it easier for service providers to interact with clients by instant messaging." Motloutsi says the application will benefit the services industry, especially those in the healthcare sector. For example, if a healthcare professional uses ServiceIQ, a client will be able to access the doctor's calendar to make an appointment without having to make calls or physically going to the practice, says Motloutsi. Both the client and healthcare professional are also able to rate the service, he adds. The application service will be available at no cost to the customer; however, the service provider will have to sign up for one of the three main packages that range from R250 to R3 000 per month. 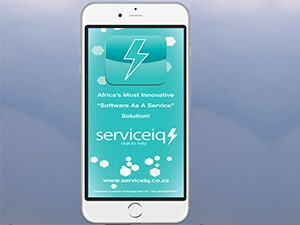 According to Motloutsi, ServiceIQ is easily scalable and can be used in any Sub-Saharan African country. A mobile app version of ServiceIQ will be available for download from the Google Play Store on 22 October, with a rollout on other operating systems such as iOS and Windows at a later stage.